In April, I was driving home and listening to my local NPR affiliate. They were playing an interview with New Mexico state Senator Michael Padilla, who introduced legislation to end lunch shaming in New Mexico. The story was incredibly sad. I was horrified that children were being told they couldn't have a hot meal, and in some cases, having their meal taken away from them and thrown in the trash. I shared the story and my concerns on facebook and my online community was equally saddened by our failure as a nation to provide quality lunches to students, no matter their family's financial circumstances. We decided that something should be done, even if it was a small gesture, to help students cover the cost of their lunches. 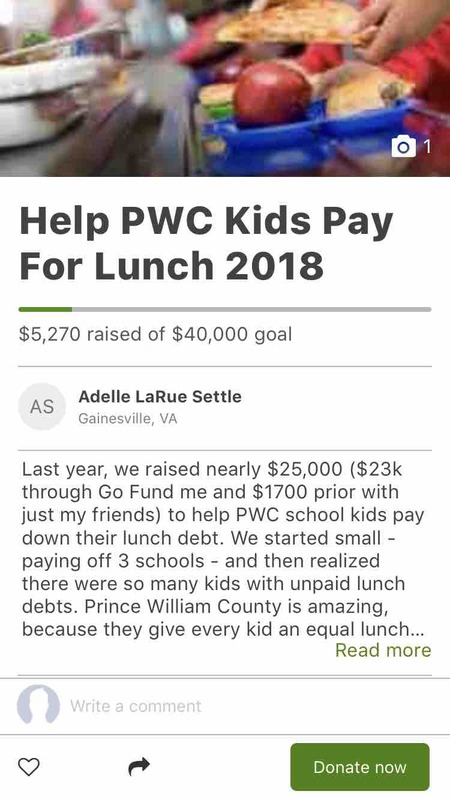 In May, my friends and I raised nearly $2,000 in 48 hours to pay off the lunch balances at three Prince William County elementary schools. It felt good to make a difference, but my friends were motivated to do more. I have spoken with the Prince William County food service coordinators for the entire county-wide school system and learned that if a child's lunch balance exceeds $50 and isn't paid, they will be sent to collections. In Prince William County, presently there is a negative balance of $160,000 in accounts headed to collections this summer, with over $300,000 in total outstanding lunch accounts. If the bills aren't paid in collections, the amount owed to food services for the unpaid lunches comes out of each individual school's general budget. This impacts the opportunities of all children attending each school. My goal is to alleviate the pressure of being sent to collections for all families in Prince William County schools. If we are able to reach this amount, we will move forward to pay off all lunch acounts in the county. dollar will bring us closer to reducing the stigma and financial burden of a family struggling to provide for their child. All donations are tax deductible through the Prince William Educational Foundation/Spark. Thank you for your generous past support! I look forward to seeing your names on the new campaign as we work to feed the kids of PWCS! Hi past supporters! I wanted to be sure you all knew that the 2018 campaign has kicked off and we have a donor matching all donations through December 2nd to the new campaign. You can give here: https://www.gofundme.com/HelpPWCkidspayforlunch. Please help us this #GivingTuesday and help provide lunch to school kids in need. ❤️ Thank you, from the bottom of my heart. 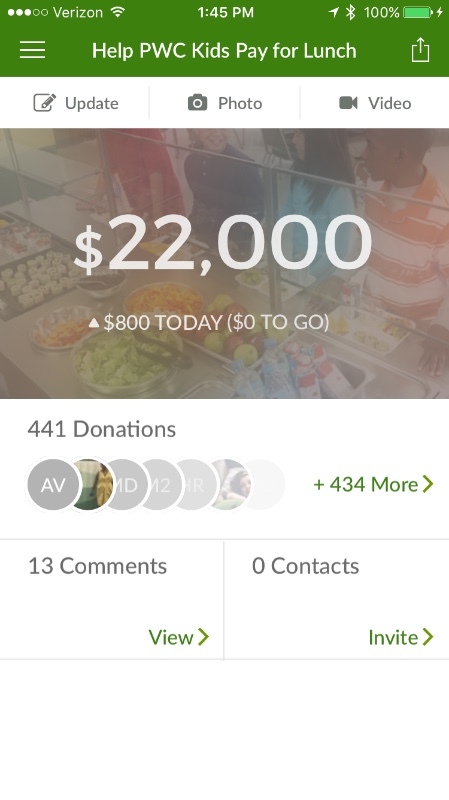 We hit our goal of $22,000!!! That's 285 families who won't be sent to collections in order to feed their kids. Thank you!! Every dollar donated from today through Aug 7 will go to additional kids in need for THIS YEAR. After August 7, the money will be held for kids who need help with their bills next year. :) Thank you! From the bottom of my heart, I just can't express my gratitude enough. Thank you so much for seeing the need in our own neighborhood. I was surprised to find out how much debt is absorbed by the schools, my school has to pay several thousand dollars each year. Would you be willing to share the amounts needed for each school? If that's to much to ask, would you post the Bristow/Gainesville/Haymarket schools? Thanks and so happy to help this great cause!! What a great idea. There are times where I have forgotten to put $ on my daughters account or didn't have it. Sad is the best they can do is give a dry cheese sandwich comparable to what is served in jails. Hey, can I have that tax exempt letter? Christopher, no child is denied a meal in PWCS. That's a wonderful thing and I commend PWCS for making that possible. But often, families aren't low income enough to qualify for free/reduced, so they have to pay for lunch. This campaign is to make it easier for those families still struggling - the working poor. Thanks for your concern! I wonder if there is a way to sponsor or help sponsor a specific school? I called Sudley Elementary and they didn't know who I should talk to about this. Can anyone give me advice about who to call? Julie, see your FB pm's. I don't have permission to share publicly, but I can help guide you privately. The Booby Bones show on the Washington DC country station ( action album radio show) was talking about imilar efforts last Friday. 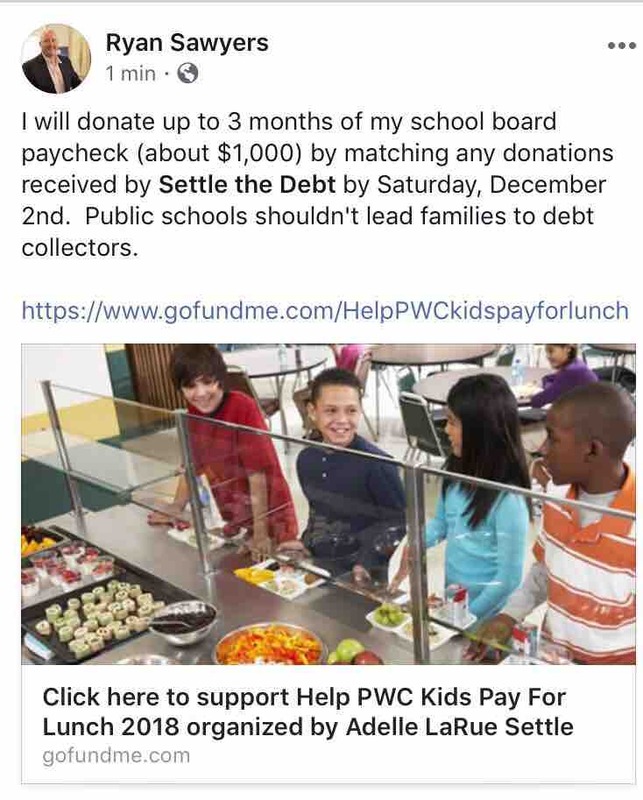 They said they wished that school districts would publish how much school lunch debt they had so people could help them out. You might could contact them and see if they will share your story. They do a segment "tell me something good". Bobby Bones' social media name is mrbobbybones if you want to tag him on Twitter or Facebook or something. This is awesome! Is there any way to help students in the Manassas Park district? May I please get the Spark thank you letter too? TIA! I don't understand how any child can be denied a basic meal at any federal/state funded school. In some cases that may be the only nutritious meal the child receives. 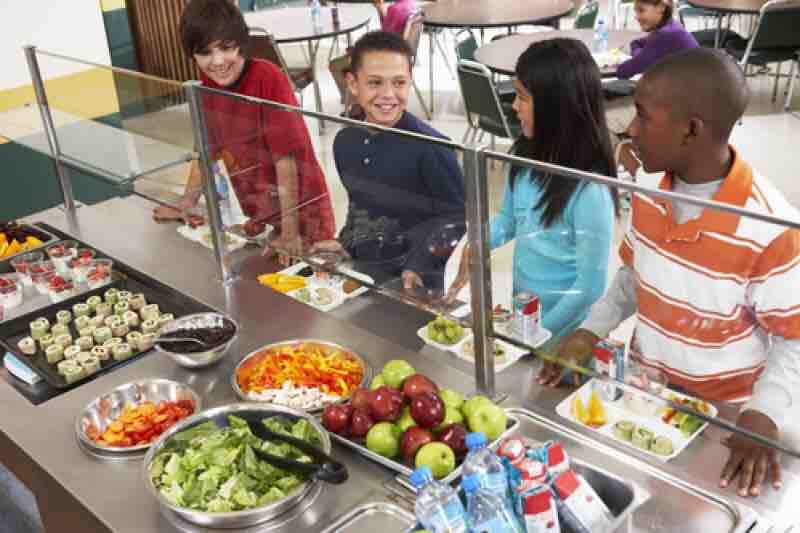 Between local taxes, free/reduced prices and "Lottery" proceeds, a healthy lunch for every student should be included as the Public School system... just like busses, extracurricular activites and facilities. If any jurisdiction can build 15 million dollar schools and pay certain administrators hundreds of thousands in salaries, they could easily pick up the tab to feed the children they claim to want to help and educate. A nutritional (common sense) meal is an easy provision and should be a mandatory one. Shame on you PWC. Jenny, it's my pleasure. Thank you for contributing. I appreciate it so much! Thank you to each and every donor, from the bottom of my heart. You have made this experience truly joyful. We have helped 285 kids and every extra dollar through Aug 7 will help more kids in need. Thank you! !